Um, no, actually. 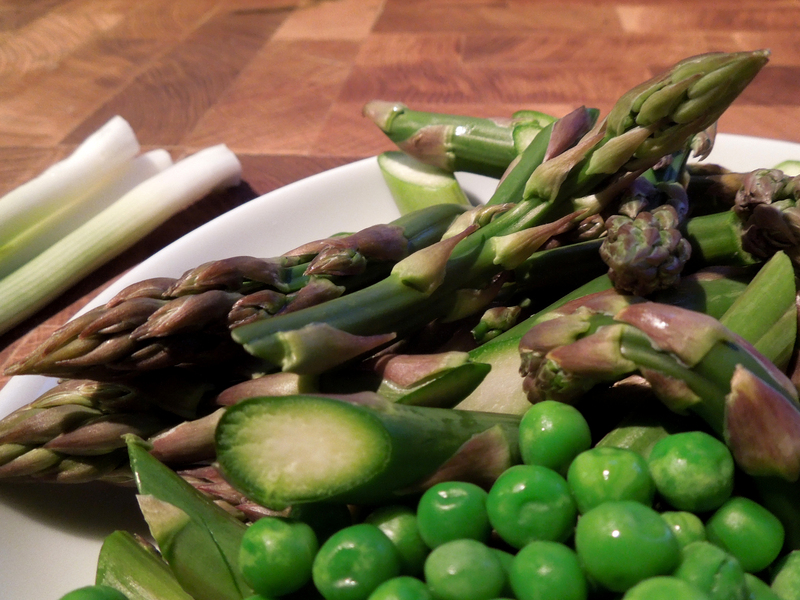 I can eat industrial quantities of asparagus and I never get fed up with it, literally or figuratively. I do like to ring the changes with the way I cook it though. Mostly we eat it steamed, with or without lashings of butter; tossed in a little oil and roasted; in soups, frittatas and risottos; and occasionally wrapped in pancakes. But the other day I made this stir-fry on the wing, as it were, to go with a spiced duck dish and it was so good I thought it was worth sharing. 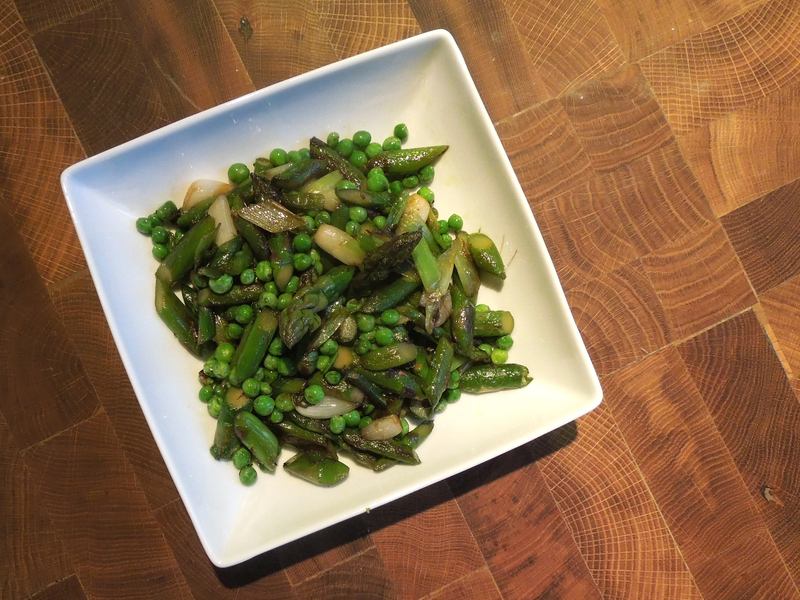 The grassy taste of the asparagus works well with the sweetness of the peas and onions and the chilli gives the whole thing a bit of zing. Bend the washed asparagus stems until they snap and discard the woody ends (save them for a stock if you like). Slice at an angle into 3cm slices. Trim the spring onions and slice on the diagonal. In a wok, heat a teaspoon each of toasted sesame oil and chilli and shallot oil (or extra sesame oil). 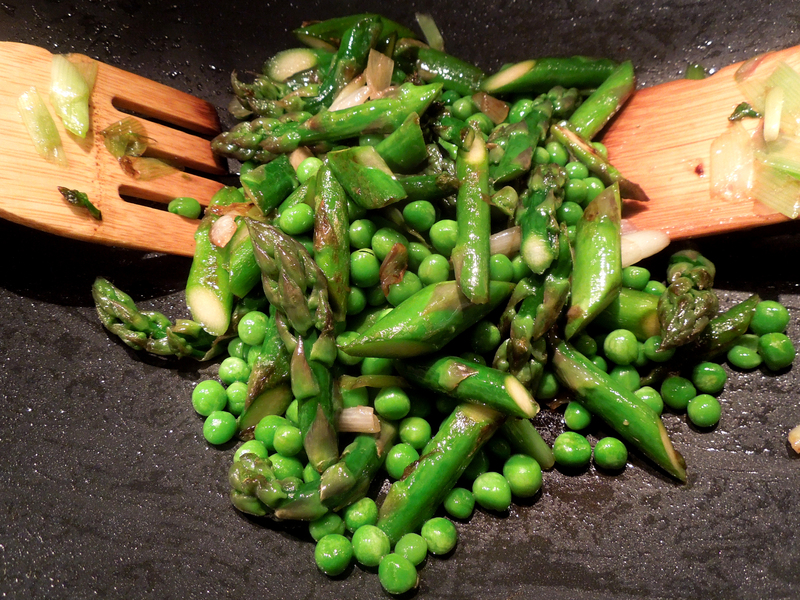 Stir-fry the asparagus first as it takes longer than you might think. After a couple of minutes throw in the spring onions. Once both are cooked to your liking add the peas and stir-fry for a minute or two longer – fresh peas will take a bit longer than frozen. If you’re using fresh chilli, add it with the peas. Now add a small splash of soy sauce, let it bubble up and boil off a little, and stir well to coat the vegetables. Serve immediately. 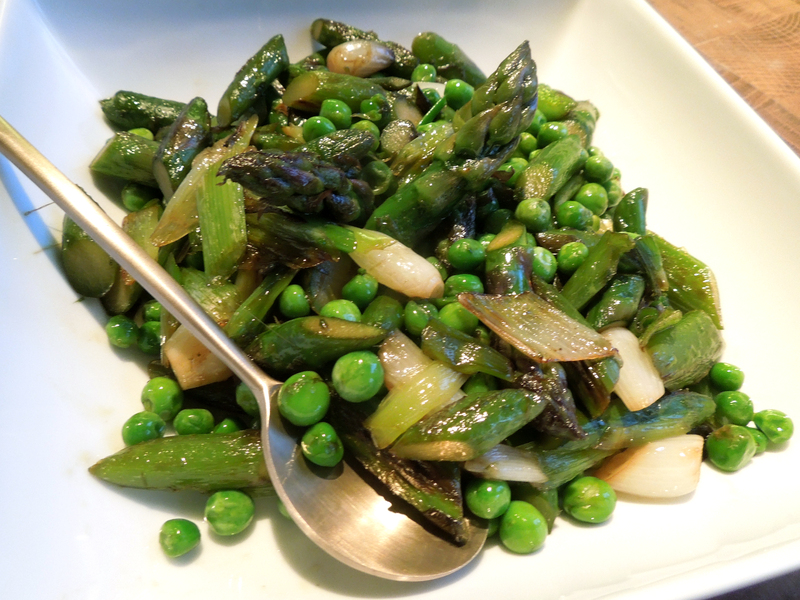 This entry was posted in In the garden, Vegetables and salads, Vegetarian and tagged asparagus recipes, stir-fried asparagus with peas, vegetarian recipes by Linda Duffin. Bookmark the permalink. I’m with you, I never get tired of asparagus. I appreciate it all the more because it is seasonal, although I’m always sad when we have to stop cutting it. ‘Bored with asparagus’?. I’m sorry, what does that mean? Like you, we usually go down the simple-is-best route. But – so long as there is still some available, and it does seem to be winding down – that looks a pretty tasty idea. Thanks, Margaret, one of those simple dishes that seems to taste better than the sum of its parts, if you know what I mean. We still have loads in the garden and another two weeks or so before we have to stop cutting it. Happy days.